The demand for easy-to-install video monitoring systems is greater than ever and Samsung is breaking the market wide open with exciting and affordable retail packages that will accelerate the market penetration of do-it-yourself video monitoring solutions. These new systems match Samsung's celebrated lines of LCDs, VCRs and DVDs with the best optical technology and network compatibility to provide reliable security at a price that is feasible for small businesses and families. Samsung's home and small business monitoring systems are versatile, offering security not only against break-ins and vandalism, but allowing busy parents to check up on the babysitter and employers to keep track of several satellite offices from a central location. Samsung offers the individual DIY System components in a wide range of customizable packages. Users can include networking capabilities that will allow them to view the camera output remotely via the Internet, and connect their system with existing home alarms. A variety of monitors, cameras and recording devices maintain a new level of safety and comfort, and advanced networking options can beam an image directly to a user's wireless device if an alarm is ever triggered. Samsung DVRs and VCRs are among the most trusted in the consumer electronics industry. DIY CCTV owners can enhance their package with a number of recording options that can connect directly to their system for hassle-free video capture. The Time-Lapse VCR option provides up to 1280 hours of recording with a jog shuttle for easy tracking, and alarm and audio recording functions. The 1 Channel DVR is a cost-effective VCR substitute that offers a removable HDD with 80GB of recording space. The DVR is easy to operate and allows simple memory stick data transfer of MJPEG video images to a user's PC. The DVR Combo offers the best of both worlds, combining a VCR with HDD data backup. The DVR Combo responds instantly to an alarm trigger, automatically recording and storing images of the area. Movement can be detected in predetermined areas by the DVR, which will automatically start recording. The sensitivity of the motion detector can be adjusted from low to high. High indicates high sensitivity resulting in a more prompt reaction to movement. Samsung Electronics SHR series DVRs provide a flexible image display. This advanced feature allows users to randomly select any camera for the main display and other cameras for the sub-displays. 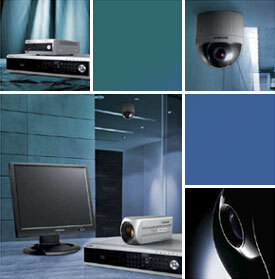 Samsung Electronics SHR series DVRs provide live monitoring and playback while recording live images simultaneously. The Network 10/100 Base-T enables monitoring over an IP through various connections - DSL/Cable Network/LAN (static/DHCP). The system supports both Samsung DDNS & public DDNS (Dynamic Domain Name Server). With the smart viewer, users can always monitor images from cameras connected to the DVR and even reach recorded imaged from a remote area. Monitoring images can also be backed up on the user’s PC.